The subject of stratigraphy once provided uninspired teachers with unrivalled opportunities to bore their students to distraction. The traditional method of teaching the subject was to choose selected parts of the world and laboriously to ascend the local stratigraphic column cataloguing the names of the principal stratigraphic units and documenting their lithology and fossil content. 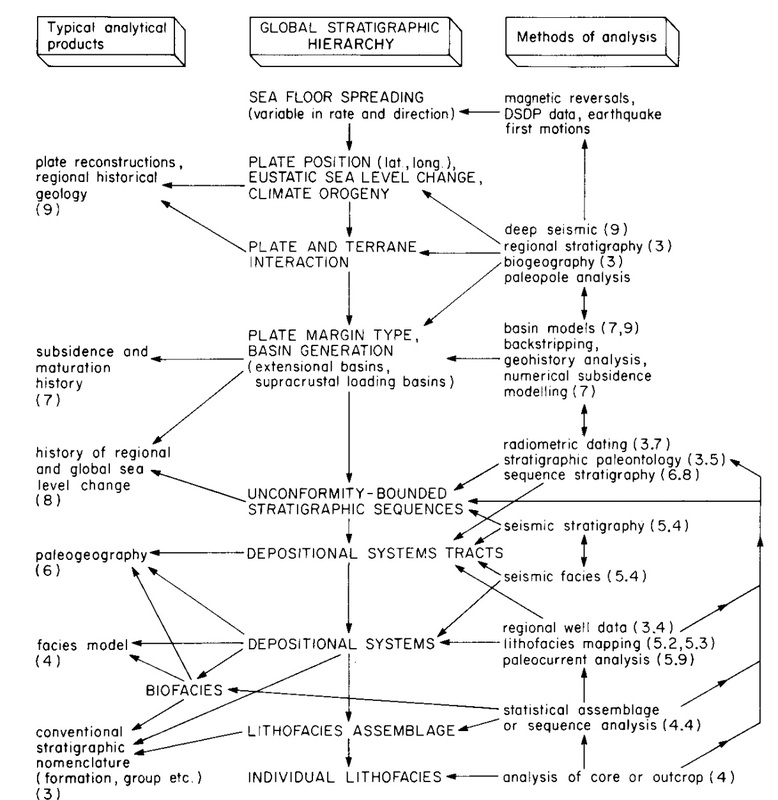 This may have been coupled with an attempt to relate stratigraphic style to theories of cratonic and geosynclinal sedimentation, but the main emphasis was on formation and group and member names, and more names. The result was the layer cake view of stratigraphy-sediments as geometrically uniform blankets bounded by the sharp vertical lines of the correlation table. There is no excuse for the continued use of such an approach. Formation names should be left to the local specialist, except for those of particular historic interest, or those of units that demonstrate a stratigraphic principle of importance. The many scientific developments touched on previously now permit and, indeed, require, a completely different, genetic approach to the subject of stratigraphy. Far from being a dull, descriptive art, stratigraphy should now be the discipline that represents the pinnacle of our achievements in studying sedimentary rocks, based on the most fundamental understanding of global sedimentary and tectonic processes. It is one of the principal aims of this book to outline the elements of this science. Unfortunately, in the present -day real world of stratigraphy, we have to deal with a wide range of different approaches to the subject. In the heavily populated parts of the developed countries, sedimentary geology is cluttered with myriads of local stratigraphic names built up since the nineteenth century by dedicated workers describing local sequences within the compass of isolated map areas. Old concepts of basin development and a poor understanding of depositional environments and facies relationships meant that earlier stratigraphic units were established in the absence of any real understanding of their origins. Arguments about stratigraphic correlation and terminology have been interminable, since the classic confrontation between Murchison and Sedgwick over the Welsh lower Paleozoic. P.D. Krynine once said "stratigraphy is the triumph of terminology over common sense." The basic problem has remained unchanged for over a century: the need (or desire) for the geologist to establish a formal stratigraphy, with named units, before he or she has had the opportunity to examine all the evidence. Ideally, stratigraphic units should be established on the basis of a basin-wide perspective, but they rarely are. Local terminologies continue to be proposed by geologists studying limited areas, while paying little or no attention to the regional framework. Until about 1960, geologists had only two, quite different practical tools for studying stratigraphy. These were lithostratigraphy and biostratigraphy. The increased pace of deep exploration drilling, particularly since World War II, did not at first fundamentally change stratigraphic practices, except that microfossils of all kinds became essential biostratigraphic tools, to complement the older studies of macrofossils, and subsurface logging methods rapidly evolved. Beginning gradually about 1960 seven fundamental changes have occurred in sedimentary geology, so that the discipline of stratigraphy, as practiced in new frontier basins, particularly those offshore, is a completely new science, bearing little relation to the subject described in such classic textbooks as Dunbar and Rodgers (1957) or Krumbein and Sloss (1963). An attempt to summarize the application of these new techniques is shown in figure above. Among the most fundamental changes have been the refinements in chronostratigraphy, the study of the absolute age of rock units, that have come about during the last two decades. Of particular importance has been the integration of radiometric, magnetostratigraphic, and biostratigraphic data. 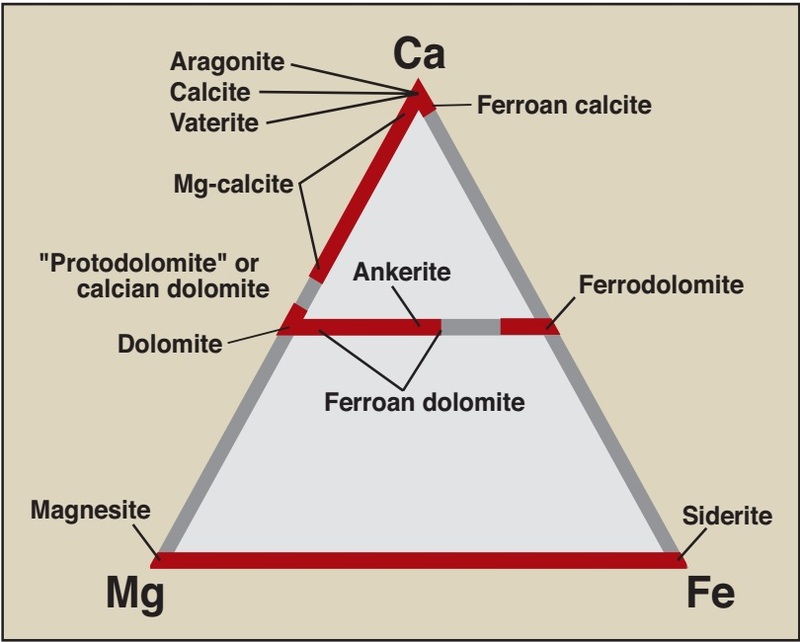 Dating of sedimentary rocks by radiometric techniques is a complex subject. In part, the results depend on the prior establishment of a refined relative-age scale using biostratigraphic methods. Harland et al. (1964) edited a milestone compilation of the research and its results for the Phanerozoic, and it has become a standard reference in the field, although revisions are continuing. The chronostratigraphic framework is now good enough that reasonably accurate ages can be given for at least the major subdivisions of the periods, for example for the Upper, Middle and Lower Devonian. In some case, particularly for Mesozoic and Cenozoic rocks, ages of individual stages are now fairly reliable. For the post-Triassic, a quite different dating technique is rapidly taking shape. This is magnetic reversal stratigraphy. Vine and Mathews (1963) were the first to demonstrate that the periodic reversal in the earth's magnetic field is recorded in a systematic manner in the new basaltic crust developed at oceanic spreading centers. As the new crust is carried away from either side of these linear spreading axes, it carries the record of the reversals with it as a kind of permanent tape recording. Detailed marine magnetic surveys run across ocean floors in the direction of spreading have produced a documentation of the reversal history that can be dated by biostratigraphic and radiometric means and correlated across all the world's oceans. Distinctive episodes in this reversal sequence are called magnetic anomalies, and these have been numbered in sequence. Attempts to develop similar records in stratigraphic rocks are bedevilled by the problems of nonsequences and erosion surfaces. Few of the intervals within the reversal sequence are distinctive, although some normal or reversed polarity intervals are markedly longer or shorter than others and may therefore be recognizable in an incomplete profile. At present, however, the use of reversal sequences in studying stratigraphic rocks is in its infancy. The method may be used for local correlation, but the older the rocks are the more difficult it is to compare these results to the standard oceanic sequence. Early developments are discussed by Watkins (1976) and Kennett (1980). The oldest undisturbed oceanic crust on earth is Jurassic, and so pre-Jurassic reversal stratigraphy must be derived entirely from sedimentary or volcanic sequences. It remains to be seen whether a reliable magnetic chronology can be developed for these. The second of the seven major changes has been the evolution of sedimentology into a mature science, capable of explaining the origin of sedimentary rocks through facies studies and facies models. The model concept was first discussed at a conference in 1958 (Potter, 1959), and the first facies models were those of Allen (1963) and Bernard et al. (1962) for fluvial point bars and Bouma (1962) for sandy turbidites. It is now possible to interpret and predict the composition, geometry, and orientation of virtually all stratigraphic units using this approach, based on a wide range of studies in modern environments and ancient rock units. 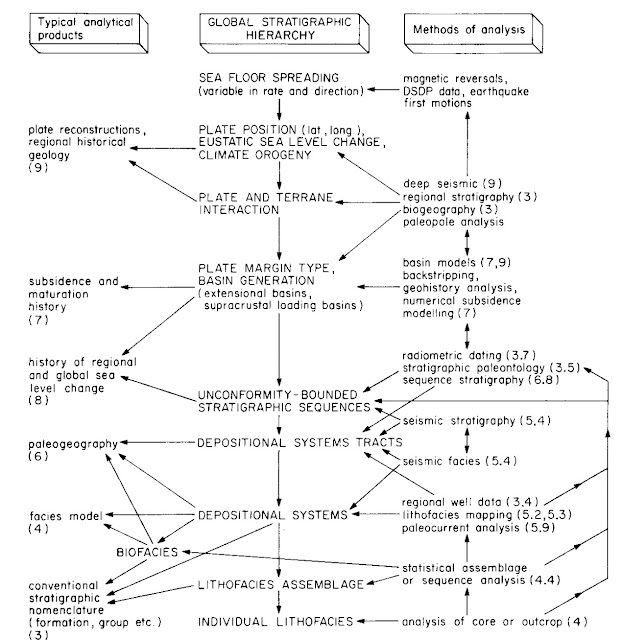 This genetic approach to stratigraphy has been carried a step further in the depositional systems method, developed by the Texas Bureau of Economic Geology, and used by Fisher and McGowen (1967), Fisher (1969), Brown (1969), Fisher and Brown, (1972), Frazier (1974), Brown and Fisher (1977), Glaeser (1979), Casey (1980), Handford and Dutton (1980), and others. This is the third major development, although the ideas are only now beginning to be widely used outside the Gulf Coast. The concept is an extension of Walther's Law, which states that, in a conformable succession, the only facies that can occur together in vertical succession are those that can occur side by side in nature (Middleton, 1973). A prograding delta is a good illustration of this. It contains prodeltaic, delta front (bay and distributary mouth), and delta plain (distributary channel and overbank) facies, which occur side by side in that order and the products of which occur together in the same order in vertical succession. A depositional system is this complete package of environments and its sedimentary products. Depositional systems are bounded by unconformities or by facies transitions into adjacent, genetically unrelated systems, such as the passage of a deltaic coast into a clastic-sediment-starved carbonate shelf. Use of the depositional systems concept enables predictions to be made about the stratigraphy of large masses of sediment, because it permits interpretations of the rocks in terms of broad paleoenvironmental and paleogeographic reconstructions. This technique has now become part of sequence stratigraphy. Sequences are regionally correlatable packages of strata that record local or regional changes in relative sea level. They may be correlatable to global standards, indicating a eustatic control. As part of the development of plate tectonic theory, geophysicists have been evaluating the rheological behavior of the earth's crust and its response to extensional and compressional processes, thermal changes, and the imposition of sedimentary loads. Work by Sleep (1971), Watts and Ryan (1976), and McKenzie (1978) provided the foundation for this area of research, which has yielded the fourth major development, the emergence of a series of powerful techniques for numerical simulation and computer modeling of basin evolution. This has brought about a profound change in our understanding of how basins' 'work, ". The fifth major development has been the evolution of modern techniques of seismic stratigraphy (Payton, 1977). Seismic reflections derived from sedimentary rocks are essentially chronostratigraphic correlation lines (Vail, Todd, and Sangree, 1977). Modern acquisition and processing techniques can now enhance seismic reords to such an extent that the fine architectural details of entire basins can be seen and mapped. In this way, major depositional systems can be delineated and related to each other. Subsurface geologists can therefore recognize the major stratigraphic subdivisions in a basin before the first well has been drilled and can describe their composition and make intelligent predictions about internal variation in an early stage of exploration drilling. By being able to see the whole before becoming bogged down in detail, the work of the stratigrapher is made immeasurably easier. Contrast this with the random collection of partially exposed, incomplete sections that the surface geologist has to work with. Application of the seismic stratigraphic approach, particularly in frontier basins, has resulted in many new ideas about stratigraphic relationships (Mitchum et al. , 1977) and the effects of sea-level changes (Vail et aI., 1977a, b). 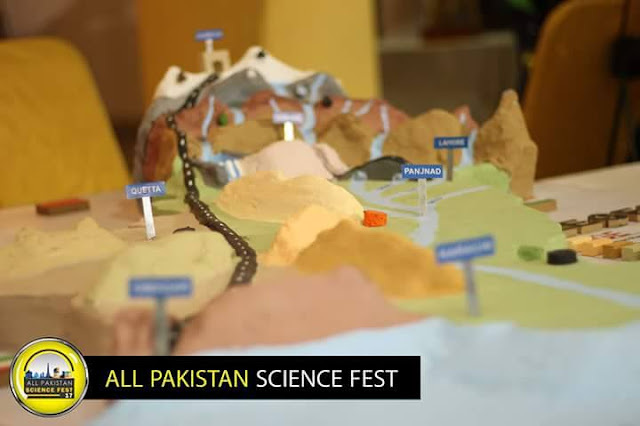 Building on the work of Sloss (1963), Vail and his co-workers demonstrated that the sediments in many basins could be divided into discrete sequences that may be capable of correlation from basin to basin and around the world. Global (eustatic) sea-level changes are the only possible mechanism for such cyclicity. Documentation of the cycle of sea-level changes throughout the Phanerozoic is now underway and may provide a new tool for regional correlation and paleogeographic interpretation, although many controversies remain to be resolved. ain to be resolved. One of the impacts of the new seismic methods was to stimulate a revitalization of interest in all forms of stratigraphic cyclicity (the sixth major development in sedimentary geology). 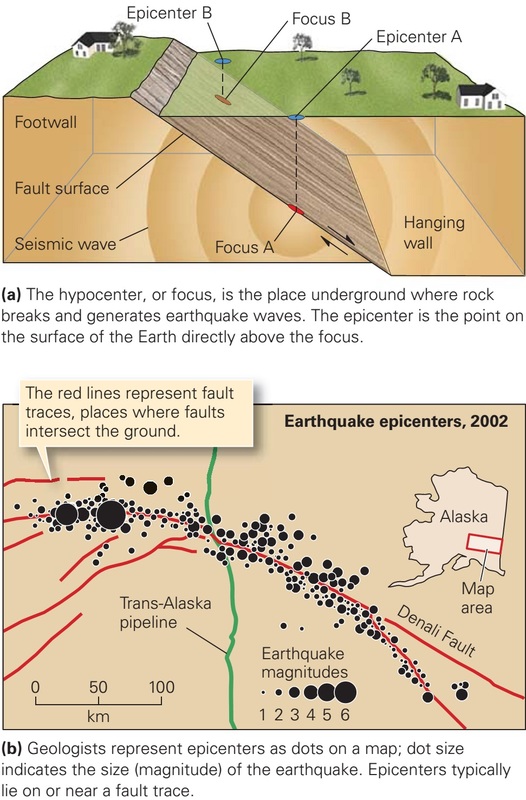 While disagreements over the meaning and interpretation of seismic records have continued during the last decade, there has been a major effort to document cyclicity using more conventional stratigraphic methods. There are at least five types of global stratigraphic cycles present in the rock record. 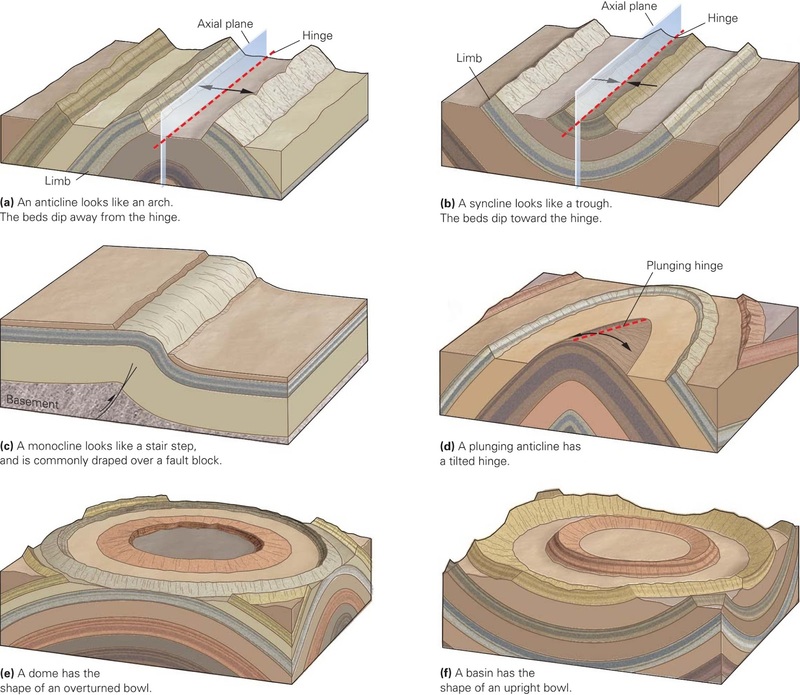 Plate tectonic theory has had a profound impact on our understanding of basin evolution and sedimentary styles (Dickinson, 1974; Bally and Snelson, 1980; Miall, 1981). Elucidation of the mechanics of plate interaction has led to the seventh major development, the emergence of a suite of basin models, characterized by distinctive structural and stratigraphic geometries and paleogeographic styles. Developments in the seven areas discussed above are far from complete, but already they require an entirely new approach to the procedures for defining, correlating, and interpreting stratigraphic units. In the past, the formation has been the foundation of stratigraphic procedure, mainly because for geologists working on the ground it was the most convenient scale of unit for mapping purposes. The proliferation of formations has hindered rather than advanced the development of stratigraphy as a science. In new or frontier areas (where the ground is still uncluttered) the geologist should now leave the definition of formations to the end of the work. The first step should be the establishment of the framework of major sequences, ideally through seismic methods or, if unavailable, through detailed lithostratigraphic correlation and biostratigraphic zonation. The next step is to interpret each sequence in terms of its component depositional systems, using sedimentological data, the principles of facies analysis, and basin mapping methods. Work in tectonically deformed rocks or in the Precambrian may have to begin at the depositional-systems stage. Stratigraphic data may be used in a "backstripping" procedure to evaluate basin subsidence history and thermal maturation. Within each depositional system, it should then be possible to recognize units of formation rank on the basis of genetic criteria, using the paleogeographic synthesis developed in the preceeding stage. If required, these formations can then be defined and named for the convenience of local mappers or prospect developers, but actual naming becomes a refinement of lower priority using this approach, rather than the culmination of the stratigrapher's efforts.